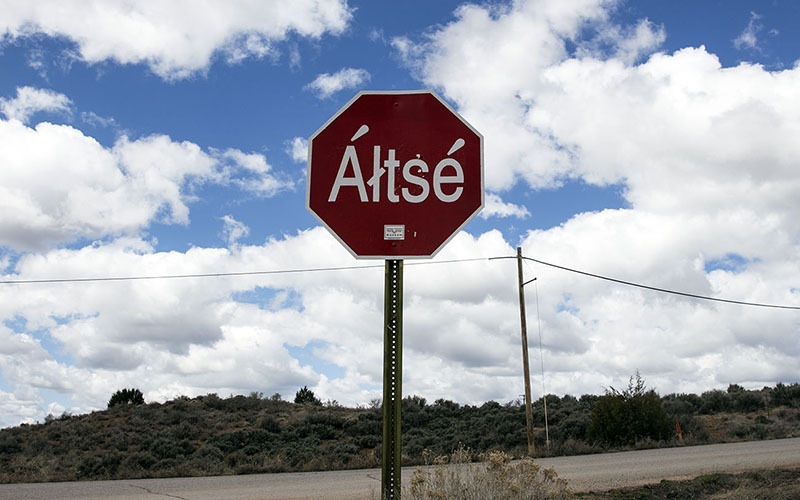 These are the first words that visitors see on a sign at the entrance of Tsé Hootsooí Diné Bi’ Olta’, an elementary immersion school that teaches the Navajo language to its 133 students on the capital of the Navajo Nation. Visitors coming to the school also see trophies. Lots of them. Two full trophy displays line the halls near the entrance and even more trophies sit on top of bookshelves in the library, or naaltsoos bá hooghan, as students and teachers call it. These trophies are awards that Diné Bi’ Olta’ students have won since the school opened its doors in 2004. 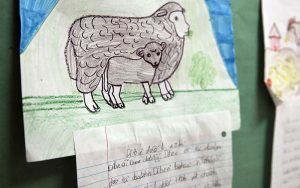 Schools on the Navajo reservation compete in annual cultural competitions that include pow wow dancing, singing, Navajo spelling bees and science fairs. Many are Diné Bi’ Olta’ students who have showcased their knowledge of Navajo language and culture, earning the school a reputation well enough to feature previous students in the Navajo-dubbed version of Pixar’s Finding Nemo, or Nemo Hádéést’į́į́. Platero says instilling Navajo values, culture and tradition within the students can help combat the looming threat on Navajo land: the loss of the Navajo language. “(Our students are) constantly being exposed to how the language and culture has shifted, and (they) are learning now it’s their responsibility to learn language and culture,” Platero said. Recent studies reveal that the number of speakers who are fluent and understand the Navajo language is declining. Wayne Holm, a researcher of Navajo language revitalization, has documented how the number of speakers began to decline starting in the 1970s and 1980s. Now, according to surveys administered by the Department of Diné Education’s Office of Educational Research and Statistics, Navajo schools encounter only one or two fluent Navajo students per 1,000. 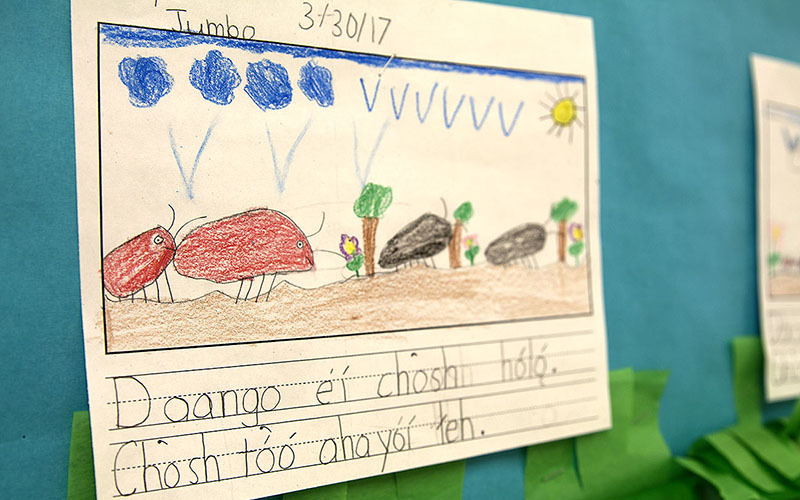 In an effort to reverse the decline in Navajo language fluency, Diné Bi’ Olta’s classes use different approaches. Each teacher comes from a different area of the reservation, and traditional teachings vary. Teachings also depend on the seasons and events occurring on the reservation, according to Platero, but some traditions that are passed onto the students include weaving, basket-making and agricultural gardening. Every Thursday, students are encouraged to dress in traditional attire. Tennell White is a member of the Navajo tribe, and two of her three children go to school at Diné Bi’ Olta. White said she chose to enroll her children in the school because of the traditional teachings. She grew up in a traditional household in Wheatfields, Arizona. She said her children are fortunate to learn about Navajo customs both at school and at home. White also said she noticed her children have gained more knowledge about traditional events that her family frequently attends in the community, such as pow wow dances. Seeing the passing on of this cultural knowledge is a highlight for fourth-grade teacher Gwendolyn Begaye, who has taught at Diné Bi’ Olta’ since 2013. 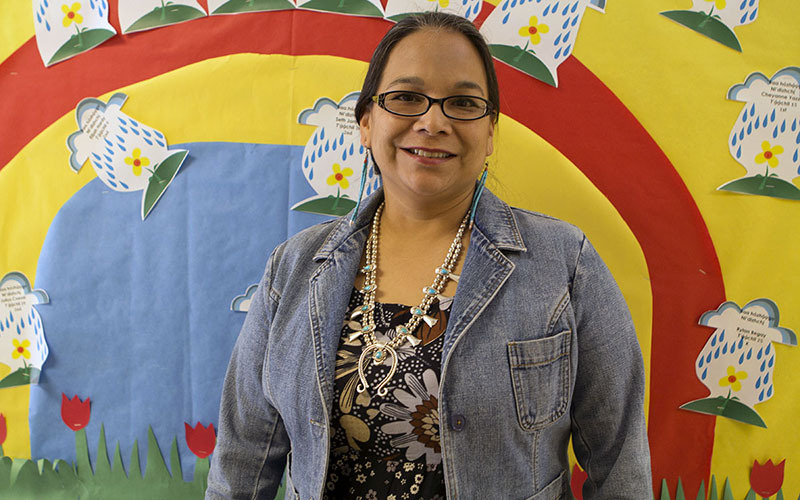 Begaye said she saw a student make a connection between lessons on electricity and gender roles in pow wow dancing (where women dance on the inside of the dancing circle, and the men dance on the outside). 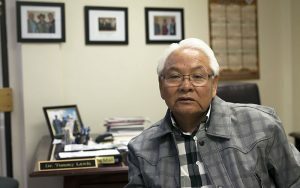 Despite a renewed emphasis on language preservation, schools that offer Navajo language and culture courses meet opposition from some parents, many of whom were raised in traditional Navajo households and even speak Navajo fluently, according to Tommy Lewis Jr., the superintendent of schools on the Navajo Nation. “A lot of the time, we get into a dispute at the school level. Some parents say, ‘I don’t want my child exposed to the Navajo language. It won’t do them no good. They need to know English in order to survive in this world nowadays.’” Lewis said. Begaye said this opposition is a barrier when it comes to effectively instilling Navajo within the students. 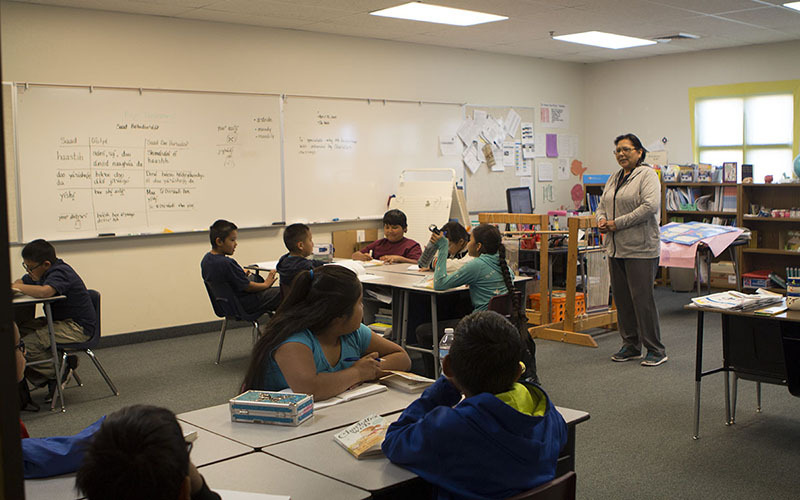 Without language reinforcement at home, Begaye said she takes every opportunity to incorporate the Navajo language into her class of 13 students. Having a rounded education in the Navajo language can increase cultural understanding which in turn, Lewis said, helps to build resilience among students. He said the future of Navajo culture is at stake. Lewis said traditional upbringing made him fluent in Navajo, and he said many young Navajos do not have that opportunity today because of an earlier push for western education. 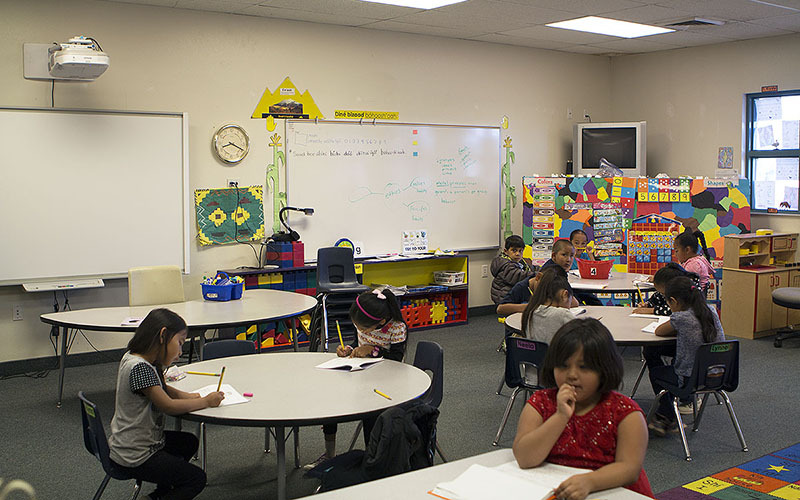 Previous tribal and federal attempts at Navajo education in schools have proved ineffective. The federal No Child Left Behind law pushed cultural education to the back burner. The tribe’s Navajo Sovereignty in Education Act of 2005 promised more Navajo education, but Lewis said schools rarely followed suit. 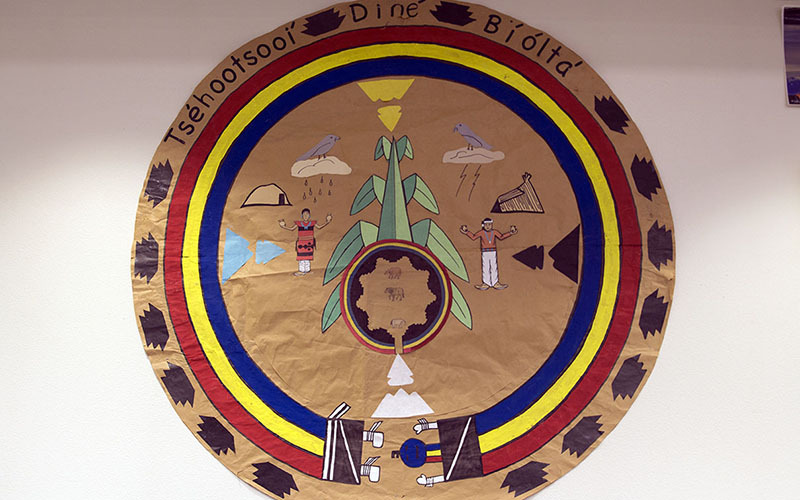 Seeking to implement more effective measures, the Department of Diné Education initiated a new law called the Diné School Accountability Plan which Lewis describes it as a new approach in Navajo education that focuses Diné content standards as a centerpiece. Though the DSAP only applies to Bureau of Indian Education schools on the reservation and not Diné Bi’ Olta’, Lewis said the intention is to instill Navajo content and standards to all Navajo students attending school on the reservation. Though the school often faces obstacles such as changes of vision in school administration and the lack of parent involvement, school funding, small student enrollment numbers and abiding by Arizona’s education mandates, Platero said her focus is making sure teachings are always being passed down to the young Navajo generation. When Begaye looks at her class, she said she dreams that Navajo education as a whole will progress for Diné children. As Lewis makes frequent visits to schools across the Navajo Nation, he said he is always astonished when students greet visitors with prayers spoken entirely in Diné bizaad (Navajo language) and exhibits Diné values. He commends those schools, noting Diné Bi’ Olta’ as an example of Navajo instruction working for Navajo youth and he urges for more Navajo families to reconnect with their language and traditions and to continue passing on these teachings to the young ones.